Sen. Bernie Sanders (I-Vt.) lit the match during Saturday's Democratic presidential debate, which was overshadowed by the previous night's assault on the French capital by Islamic State Group operatives. Climate change, the presidential contender said, is "absolutely" the largest single largest threat to U.S. security. "In fact, climate change is directly related to the growth of terrorism," he added. His words drew immediate pushback from Republicans, conservative bloggers and even former Obama campaign adviser David Axelrod, who said the Vermont senator had been "a little tin-eared" (ClimateWire, Nov. 16). But while most Democrats shied away from linking the attacks that killed nearly 130 people to the aim of the United Nations conference that begins in Paris on Nov. 30, Sanders' words echo one of the Obama administration's favorite themes -- that climate change is a "threat multiplier" that will breed conflict around the globe as desperate populations compete for scarce resources. Secretary of State John Kerry raised eyebrows last year during a visit to Indonesia when he called man-made warming "perhaps the world's most fearsome weapon of mass destruction." He went on to argue that it ranks with terrorism, epidemics and nuclear proliferation as a threat to U.S. security (Greenwire, Feb. 17, 2014). And President Obama told Vox in February that the media "sometimes overstates the level of alarm people should have about terrorism" when compared with the human suffering that will be caused by climate change (Greenwire, Feb. 11). Sen. Ed Markey (D-Mass.) said yesterday that he was convinced climate change and terrorism were "without question" linked. He pointed out that drought paved the way for famine and then civil war in Somalia. "The same thing is true in the Sudan, the same thing is true in Syria," he said. These messages don't sit well with conservatives who say that a focus on climate change detracts from efforts to contain terrorism and siphons away needed resources. Sen. Bob Corker (R-Tenn.) said it seemed to him that terrorism and climate change were "very nonrelated." "I just think sometimes people when they're pursuing an issue that they care deeply about will make very strange connections to other issues that they see momentum around," he said. "I think that would be the case here." The Foreign Relations Committee chairman, who accepts that human emissions play a role in warming, said his panel would wait to see what the Paris accord looked like before it decided how to act. Even if the administration makes the determination that an agreement is not binding under international law, and therefore need not be submitted for Senate approval, he said, "I think Congress is going to want to make its own determination." Sen. James Inhofe (R-Okla.). Photo courtesy of Congress.gov. "I think you'll see members of Congress on both sides of the aisle being very proactive on that," he said. 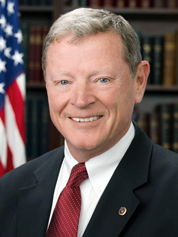 Sen. James Inhofe (R-Okla.), who chairs the Senate Appropriations subcommittee responsible for funding the Defense Department and who does not believe that warming is human-induced, has long complained that too much of DOE's budget is frittered away on programs to boost energy efficiency or alternative fuels -- which he says have little to do with the military's mission. "And I think people need to understand that there's a price we're paying for all these agendas that have been rejected by Congress," he said. Inhofe estimates that during Obama's first five years in office, the DOD spent $120 billion on what he calls "the environmental agenda." Marc Morano, a former Inhofe aide who now runs the skeptics blog Climate Depot, disputed any link between climate change and national security. "These claims amount to nothing more than ideological grandstanding to say whatever they can to make 'global warming' an urgent priority," he said. "In the wake of the terror attacks in Paris, claiming that attempting to 'solve' global warming is even more urgent is baseless and absurd. "No one seriously believes that the Middle East was a peaceful place when carbon dioxide was below 350 parts per million," he added, referring to the ratio of carbon dioxide molecules that scientists say is safe. National security organizations and think tanks have produced substantial research projecting that warming will exacerbate existing problems like infectious diseases and resource competition, which underlie many of today's conflicts. But to jump from there to contending -- as Sanders does -- that warming will fuel terrorism is less supported, experts say. "Nobody can really understand why a person becomes a terrorist," said Andrew Holland, senior fellow for energy and climate at American Security Project. He acknowledged that a link existed between climate change and some of the factors that contribute to destabilization. In the case of Syria, for example, an intense drought in 2006 and 2007 dropped crop yields, driving people into the cities and helping to set the stage for protests against the Assad regime that -- when brutally suppressed -- turned to revolt. But to say that climate change created the Islamic State group, he thinks, is a stretch. "The answer to stopping the Syrian civil war wasn't necessarily to stop carbon emissions," he said. "This is why it's not a good bumper sticker." Climate change "dried out the already-existing tinder that could start the fire," he said. But he added that conservatives also were bending the truth by insisting there was no relationship between global conflict and the impacts of warming. A national security policy that focuses only on AK-47-wielding terrorists and does not consider threats that are harder to quantify will be short-sighted and ultimately ineffective, he said. "We can't let the urgent and immediate take away from the important and chronic," he said. Keya Chatterjee, executive director of U.S. Climate Action Network, said she believes the links between climate change and terrorism need to be discussed even more in the wake of the Paris attacks. "We have to talk about it," she said. "It is complicated, and it is not direct, but the relationship is there, and if we don't talk about it, it's only going to get worse. If you don't talk about how drought and lack of food and water leads to insecurity, then these problems don't get dealt with. So I think that despite it being complicated, we have to talk about it and help people understand the relationships."